"When the Tokugawa shoguns were absent from Niko Castle, the group of samurai known as the "Nijo Zaiban" were dispatched by the shogunate for night watch and patrol. 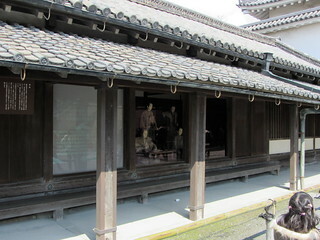 A single group was composed of fifty men and two groups were stationed permanently at Nijo Castle though each year in April they alternated with other squads. This guard station was one office of that Zaiban and it is understood to have been built in the third year of the Kanbun era (1663). "The building consists of gabled-roof construction with a frontage of ten "ken" (a ken being approximately 1.9 meters, in sum bere at 19.6 meters) and a depth of three ken (6.1 meters). Extant castle guard stations are few within the country and so this is a treasured building."